Another Beautiful Day in Paradise. It was in the mid 60s when we started and in the low 70s when we finished. Perfect for us. 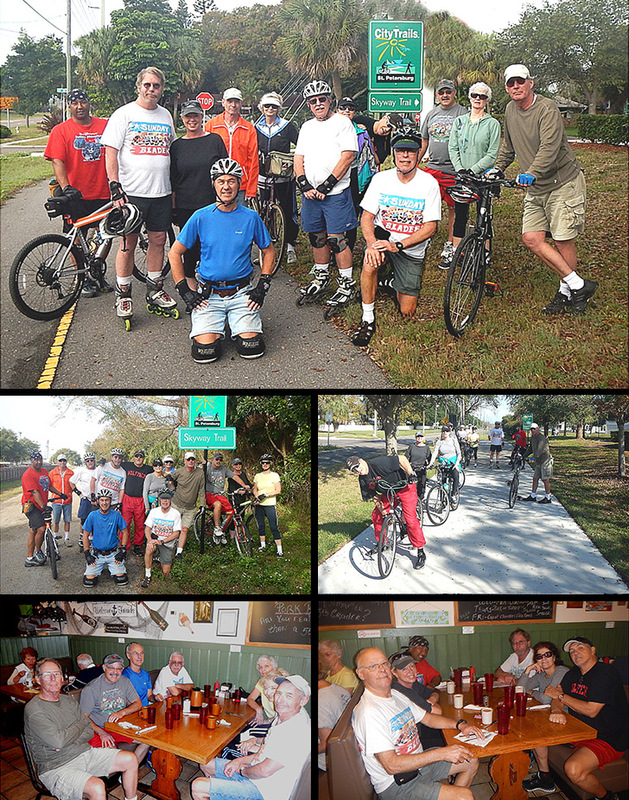 Bladers/Bicyclers Rick the Breeze, Bill S, Dee T, Joesph W, Rick P, Ginnie S, Diane S, Roy H, Rob H, Laura P, Carol J, Jeff B and Bruce M came. Welcome All. The streets were a little wet so we decided to do the Skyway Trail but have the bladers drive to 54th Ave & 34th St and we would bike and meet them there. This worked out just fine. The bicyclers did 12 miles and the bladers did 10 miles. We had 3 Bladers and 10 Bicyclers. Thanks to Dee for handling the Blade/Bicycle on 26 January. Diane L renewed her Sponsorship. Thanks Diane for the website support. We brunched at Skyway Jacks. Dee and Jeff went ahead and made reservations for us. We got in pretty quickly and sat at two tables. The coffee flowed freely. At our table they even gave us a big coffee mug full of coffee. The food and service were very good. Rob rated his Brunch a 9.5.